A question all of China is asking but I didn't expect an elderly man to stop by the pond in Zhou's home village and press me for answers. Until recently one of China's most powerful politicians, Zhou Yongkang has simply disappeared, presumed victim of the Orwellian security apparatus he once controlled. In this picture-postcard scene complete with ducks on the pond and hens on the green, the whitewashed family compound was giving nothing away to the trickle of scandal-hunters loitering at the gate. And in faraway Beijing, Zhou's name has not been mentioned in the official media for seven months. Why should we care? After all, this is a man who retired 18 months ago and who even most Chinese wouldn't recognise. If he's come unstuck in the kind of palace politics he once played so well, his prison cell will be no worse than those he forced so many others into during his years running a brutal security system. But stand back from the hens and the ducks and listen to the deafening silence from Party high command. Zhou Yongkang's story goes to the heart of China's stability and reform momentum. The fight to bring him down is the politics to watch. Zhou Yongkang's career is a Chinese style rags-to-riches fairytale. His family were hard-pressed farmers who fished for eels to supplement their income. The parents encouraged their three sons to study and the eldest repaid them by going to university and becoming an oil engineer. He accelerated through Party ranks to run China's biggest oil company and then a province of 80 million, crowning his career with a seat at the Party's top table and control of the vast internal security apparatus. Beyond his home village, he could never have claimed to be the most loved man in China but until 18 months ago he could claim to be the most feared. At that point Zhou's luck changed. Xi Jinping took up the leadership of the Communist Party and announced a campaign against corruption. A war on "tigers as well as flies", he warned. Zhou Yongkang is his chosen tiger. But why go looking for a fight with a dangerous predator? "Three reasons," says political analyst Deng Yuwen. We were talking over a game of 'go', the board game of black and white stones that strategists have been playing for 2,000 years because it sharpens their wits for the real game of politics. "The first reason for taking on this tiger is to consolidate power and gain respect. "The second is to push forward reform. There are lots of powerful people in government whose wealth is not clean, and they all have a vested interest in the status quo. "If you want to reform the economy now, you have to find a place to break through their lines. Zhou Yongkang is that place. "The third reason is to improve the image of the Communist Party." This all makes sense to me. On consolidating power, China's one-party political cycle offers no electoral mandate to an incoming president. Taking out a rival with a corruption trial clears space for one's own people and policies. Reform also adds up. After a decade of delaying vital changes, China needs political direction. The incoming leadership seems resolved to restructure an economic model which has seen stunning growth for 30 years but which most agree is unsustainable. One of the most unsustainable things about it is the stranglehold of state behemoths in key sectors, many of them controlled by the Party elite. Remove them and Xi has room to reform. Witness the purge of Zhou Yongkang's placemen from the oil and gas industry over recent months. As for improving the image of the Communist Party, this, too, is urgent. It's hard to exaggerate the depth of public cynicism about the political class. We're not talking about a Westminster expenses scandal over the odd duck house or extra apartment. As the Chinese economy has surged, senior Party officials have used their monopoly on power to plunder billions from the public purse, many hiding their fortunes in offshore accounts and foreign assets. In Zhou Yongkang's case, the respected financial journal Caixin has traced a web of business interests which it says made the Zhous spectacularly rich. Now assets have been seized. Family members, drivers, bodyguards, secretaries and proteges have all been detained. While Zhou Yongkang's name is unspoken in the media, there is an almost daily scandal feed about allies from his networks of influence, whether in the energy sector, in Sichuan province or in the security system. "Xi is plucking the fur from the tiger," says Deng Yuwen, sweeping one of my poorly-defended troop formations from the go board as if to demonstrate how it's done. But it's hard to judge whether the public will draw the conclusion Xi Jinping wants from all of this. How much Party scandal can they bear? Last year saw the trial of former Chongqing Party Secretary Bo Xilai, a spectacle which lifted the lid on the crime, corruption and downright depravity that passed for politics in one of China's largest cities. But Bo Xilai was only on the Politburo, i.e. in the squad but not the first team. If Zhou faces trial on corruption charges, he will be the most senior leader to do so since the Communists took power in 1949. Serious brand damage for the Party. Xi Jinping has two other vital calculations. Since the beginning of the reform era, members of the Standing Committee have left each other's families and business interests alone. They all remember the purges and show trials of their parents' generation and know from experience that doing their dirty washing in public leads to bloodletting and chaos. Now Xi Jinping has broken that pact and the other top families will ask each other who is safe and who is next. Also, a cornered tiger is still a dangerous tiger. The former security chief knows all the innermost secrets of the elite, including plenty about Xi Jinping's family which might be damaging if made public. Zhou may be cornered but he still has claws that could do Xi Jinping a mortal injury. As Deng Yuwen puts it: "If he tries to fight Zhou to the death, Zhou will take him and the Party to the bottom. They will die together. "Xi has to leave Zhou a stake in keeping the Party afloat. That's what they're fighting over now." On the go board, I conceded defeat to Deng Yuwen and we poured the black and white stones back into their woven baskets. As the weeks and months go by without a clear outcome, the battle on the big board remains the one to watch. Everyone is waiting uneasily to see whether this president can tame his tiger. 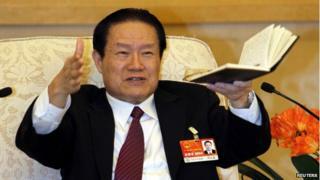 Zhou Yongkang next to fall in China corruption purge? How real is China's anti-corruption campaign? Will China's leaders regret Bo Xilai's fall?